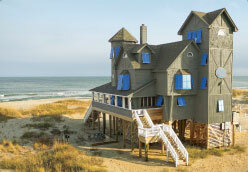 You can see the famous house from the movie "Nights in Rodanthe" here, or even stay! Rodanthe is the northernmost village on Hatteras Island, just south of and adjacent to the vast Pea Island Wildlife Refuge. Access to the refuge provides ample opportunity to witness various species of birds indicative to the area as well as curious exploration through miles of unspoiled wetlands. Rodanthe is a favorite destination among vacationers looking to “get away from it all” yet be a convenient distance to the more bustling attractions of the Northern Beaches for day shopping trips or other activities such as visiting well-known historical monuments. Most famous for being featured in the major motion picture “Nights in Rodanthe”, based on the novel by Nicholas Sparks, the natural beauty and tranquility of Rodanthe is unparalleled. The house that was featured in the motion picture, property R-51, is managed by Sun Realty and weekly vacations are welcomed year-round. Rodanthe is also renowned for its abundance of water sports such as kiteboarding and surfing. Many visitors opt to explore the Pamlico Sound and its shoreline by kayak to view the abundant natural resources tucked away in the lagoons within the marshes. For the history lover, the heritage of the US Lifesaving Service can be discovered at the Chicamacomico Lifesaving Station and more maritime history, as well as a great view of the island, can be discovered at the Cape Hatteras Lighthouse in Buxton. Regardless of what you're looking to do on vacation, Rodanthe truly has is all, history and convenience encased in the laid back lifestyle that is a true Hatteras Island tradition. Sun Realty is proud to represent vacation homes in the village of Rodanthe and the properties offered by Sun Realty in this area range from classic, "beach boxes" to more larger, OBX vacation rentals.